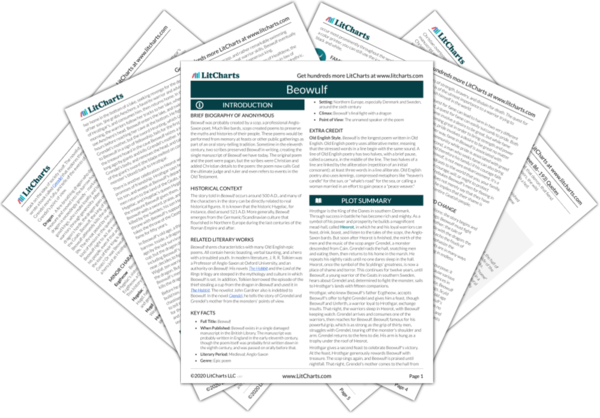 Instant downloads of all 945 LitChart PDFs (including Beowulf). 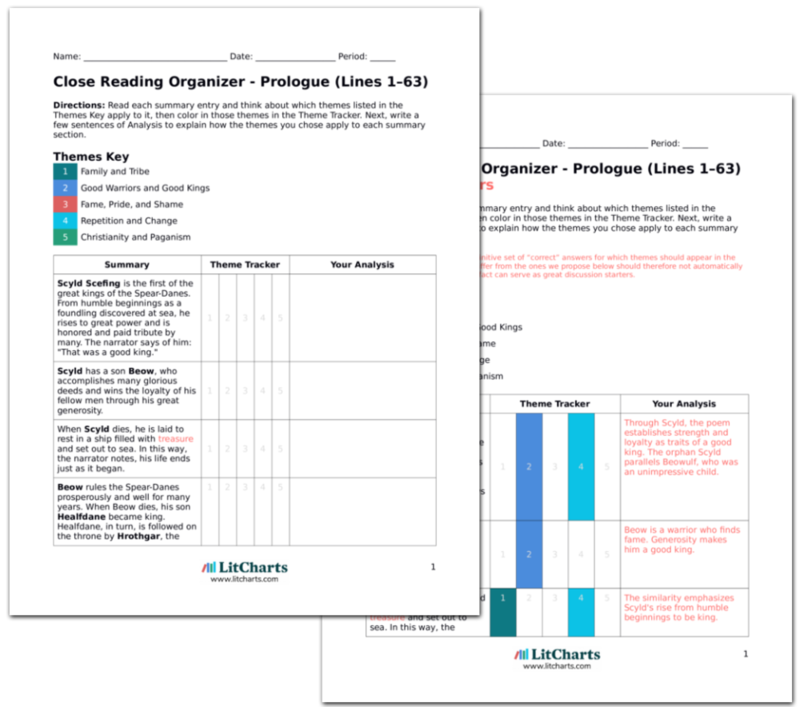 LitCharts assigns a color and icon to each theme in Beowulf, which you can use to track the themes throughout the work. Beowulf thinks that he must have offended God in some way to be attacked by the dragon. He decides to fight the beast. He orders that a special shield be made for him, one made entirely of iron instead of wood. He chooses not to raise an army to fight the dragon, believing that he is equal to the task since he has overcome so many dangers in his life, including defeating Grendel. Beowulf decides to fight the dragon just as he once fought Grendel. But then he was a warrior. Now he's a king who is responsible for his people. It can be argued that Beowulf's decision, while courageous, is inappropriate for a king. The narrator recounts one of Beowulf's feats: in the battle at which Hygelac was slain, Beowulf swam back to the land of the Geats carrying the armor of thirty men on his back. In Geatland, Hygd offered Beowulf treasure and rulership of the kingdom, fearing that her son Heardred was too young to rule. But Beowulf refused to take the throne, instead choosing to loyally serve and advise King Heardred. After Heardred was killed in a feud with the Swedes, Beowulf took the throne and exacted revenge on the Swedes. Beowulf exhibits not only courage, but extraordinary loyalty when he refuses to take the throne from his cousin. Again, he is an example of the way family members should behave. But that selfless devotion to his people contrasts with his prideful decision to fight the dragon. Along with eleven Geatish warriors and the man who stole the cup, Beowulf marches off to face the dragon. By the dragon's barrow, Beowulf, ready for death, speaks to his men. He tells them of his youth in the court: his father left him with King Hrethel when he was seven, and Hrethel treated him as much like a son as he did his own true sons Herebeald, Haethcyn, and Hygelac. Beowulf then recounts how Haethcyn accidentally killed his brother Herebeald, embittering the rest of Hrethel's life because he was unable to avenge the death of his son because to do so would mean murdering his other son. Haethcyn took the throne when Hrethel died, and was killed in battle against the Swedes. The accidental killing of one son by another is a double tragedy for Hrethel, and a variation of what happened to Hildeburh in The Fight at Finnsburg, when her brother and son fought against each other and were both killed. Hrethel loses a son, but can't behave in the way that society says he must by avenging the son's death because he would then be killing his other son. Beowulf tells also how he repaid Hygelac's gifts of treasure and land with loyal service, not only leading Hygelac's warriors into battle, but also killing the Frankish king who killed Hygelac in battle. Now, Beowulf says, he shall fight once more: against the dragon. Beowulf recounts his deeds as a warrior, and then says he'll fight the dragon. Even he seems to imply that fighting the dragon is the act of a warrior, not a king. 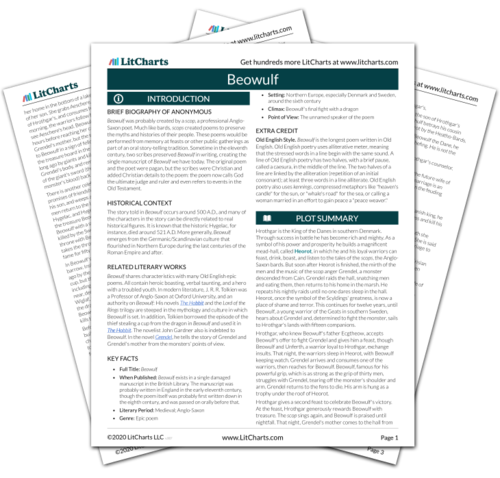 Get the entire Beowulf LitChart as a printable PDF. Since the dragon breathes fire Beowulf decides to use his sword, shield, and armor. He orders his followers to wait for him at the barrow. Against Grendel, Beowulf trusted his hands and his fate. Not this time. Beowulf enters the barrow and shouts to wake the dragon. It attacks, breathing flame. Beowulf's shield protects him, but not for long enough. The narrator says that "for the first time, fate did not make Beowulf the winner in battle." Beowulf's sword fails when he strikes. The dragon blasts him with "death-fire." Does fate fail Beowulf because, by using a sword and shield, he did not fully trust fate to protect him? Instead of helping him, ten of Beowulf's warriors flee. Only Wiglaf of the Waegmundings has courage enough to help Beowulf. He berates his comrades for deserting their lord who gave them so much treasure, and goes to help his king. The warriors don't just betray Beowulf, their king, by deserting. They also betray themselves and their people. The dragon charges Beowulf and Wiglaf. Their shields are burned and their armor offers them little protection. Beowulf strikes the dragon's head with his sword, driving it in to the bone, but the sword, Naegling, breaks and the dragon bites Beowulf in the neck. As Beowulf staggers, Wiglaf stabs the dragon in the stomach, and gets his hand burned in the process. Beowulf then takes the chance to pull a knife he wears on his mail shirt and stab the dragon. Together, Beowulf and Wiglaf kill the dragon. But the bite in Beowulf's neck begins to burn and swell from the dragon's poison. Beowulf, a king, is overmatched when he's alone against the dragon. It's only when the king is joined by his warrior that he has a chance against the beast. Yet it is not enough. Unlike Beowulf's earlier battles against Grendel and Grendel's mother, in this battle he is injured, and his injury is fatal. Florman, Ben. "Beowulf Facing the Dragon (Lines 2324–2710)." LitCharts. LitCharts LLC, 22 Jul 2013. Web. 4 Nov 2018. Florman, Ben. "Beowulf Facing the Dragon (Lines 2324–2710)." LitCharts LLC, July 22, 2013. Retrieved November 4, 2018. https://www.litcharts.com/lit/beowulf/facing-the-dragon-lines-2324-2710.